“Fastball John” by John D’Acquisto and Dave Jordan rivals Mike Piazza’s “Long Shot” as one of baseball’s best books of the decade. “Fastball John” features a prolific foreword by baseball historian Dan Epstein as well as references to a soundtrack of pop culture including: the Everly Brothers, the Byrds, Crosby, Stills and Nash, the Carpenters, the Temptations, Led Zeppelin, the Eagles, David Bowie, Fleetwood Mac, Donna Summer, Nicolette Larson, Blondie, Dave Mason, Don Henley, the Pretenders and New Order. “Fastball John” D’Acquisto will be signing his new book on September 24th and 25th from 1 to 4 PM at The Pennant, 2893 Mission Blvd. in San Diego’s South Mission Beach. It will be a family reunion of sorts since John Francis D’Acquisto was born in San Diego on December 24, 1951. He would later become a hometown hero while attending St. Augustine High School, where he excelled in both football and baseball. 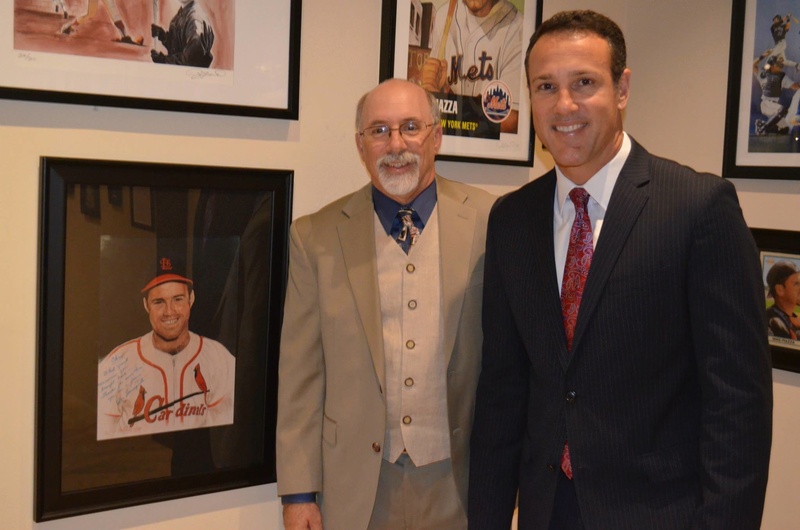 Italian American pitcher John D’Acquisto made a personal appearance and speech at the Artists’ Tribute to Italian Americans in Baseball Exhibit in San Diego. Celebrating its 70th anniversary on the waterfront, Anthony’s is San Diego’s original Seafood Restaurant. As an active member of the MLBPA, John D’Acquisto works in the broadcast booth for various MLB games. 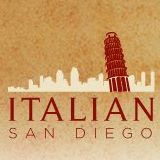 In the 1920’s, most Italian immigrants who settled near downtown San Diego were fishermen from Genoa and Sicily. Many other Italian fishermen and their families moved to San Diego from San Francisco after the devastating 1906 earthquake. Like Joe DiMaggio’s father– who was a fisherman in the Bay Area–John D’Acquisto’s father, Fred D’Acquisto Sr., also depended on the fishing industry to put food on the table. As serendipitous as it may sound, the two sons of Italian immigrant families would meet in 1975 when John was honored by Joe DiMaggio and the Italian-American Society as its “Italian-American of the Year”. John’s father, Fred D’Acquisto Sr., was a local San Diego celebrity for 51 years as he worked for the legendary Anthony’s Fish Grotto Restaurant in the vibrant downtown Little Italy community. Starting out as a young teenager, John’s father worked himself up to dining room manager and would split his time between the original restaurant and their sister location, the Star of the Seas. A first-round pick in the 1970 amateur draft, John D’Acquisto was selected by the San Francisco Giants. Blessed with a death-defying fastball, “Johnny D” made his MLB debut for the Giants late in the 1973 season. He was named National League Rookie of the Year and National League Rookie Pitcher of the Year by The Sporting News in 1974. During the span of his ten season career, John D’Acquisto pitched for the Giants, Cardinals, Padres, Expos, Angels and Athletics from 1973-1982. Read John’s blog and order “Fastball John” today by clicking HERE. Fastball John D’Acquisto pitched for the San Diego Padres from 1977 to 1980. San Diegans were given a Christmas present with artists Vincent Scilla and Christopher Paluso in town. The holidays may be over but San Diego is still celebrating since two of the most influential artists behind the Artists’ Tribute to Italian Americans in Baseball Exhibition are speaking this weekend in America’s finest city. Traveling all the way from New York’s Greenwich Village is internationally-renowned sports artist Vincent Scilla. San Diego Hall of Champions resident artist and local favorite educator Christopher Paluso will host the visiting East Coast cultural icon on Sunday, January 12th at the Convivio Center in Little Italy. 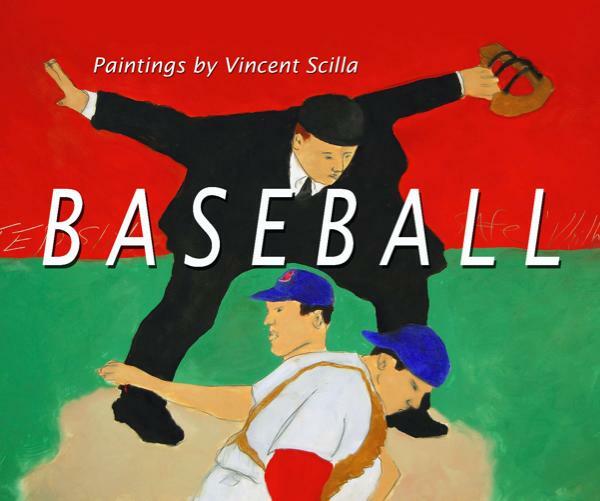 Vincent Scilla’s critically-acclaimed book “BASEBALL” was published by London’s MQ Publications. Artist Vincent Scilla speaks on the Italian American Experience on Sunday, January 12, 2014 at Convivio, 2157 India Street in San Diego’s charming Little Italy. He will be joined by San Diego Hall of Champions resident artist Christopher Paluso. Admission is free. As a multi-talented painter, filmmaker, and photographer, Vincent Scilla has come a long way since graduating from college at the University of Michigan. During his illustrious four decade career, he has garnered countless accolades, grants, and honors for his fine craft. Beginning as a photographer, Scilla’s works were first showcased at the Detroit Institute of Art in 1969 as part of the prestigious Michigan Artists show. 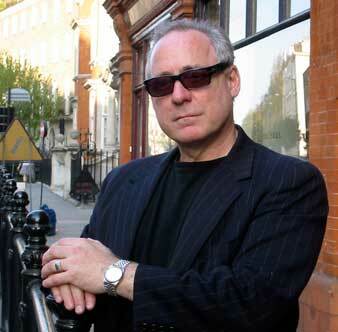 His images have graced the pages of the New York Times and the Village Voice. The experimental filmmaker and director of “Thunder in the Afternoon” and “Flyin’ No-Low Altitude” received numerous awards and noteworthy praise at popular film venues including the Collective Living for Cinema and the Ann Arbor Film Festival. 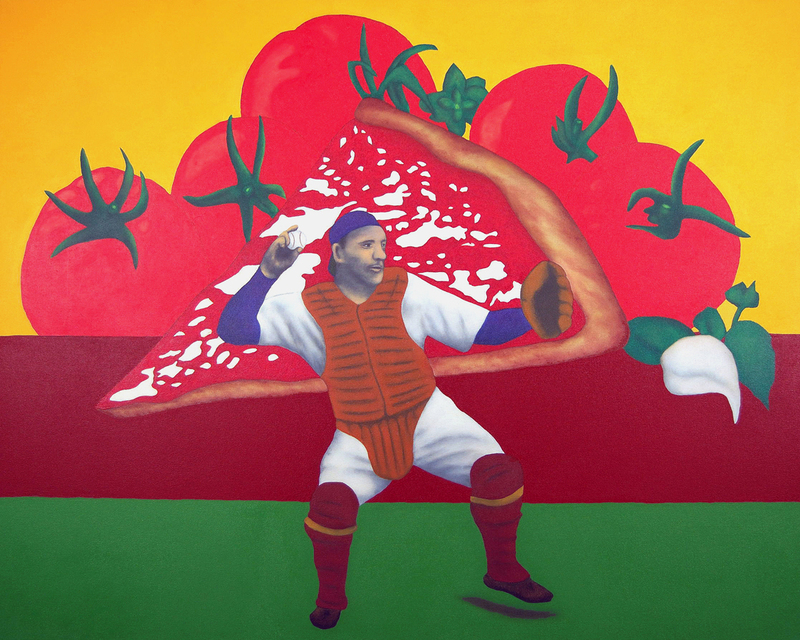 Vincent Scilla’s “Pizza Lombardi” pays tribute to Baseball Hall of Famer Ernie Lombardi and America’s first full-fledged pizzeria–Lombardi’s–which was established in New York in 1905. 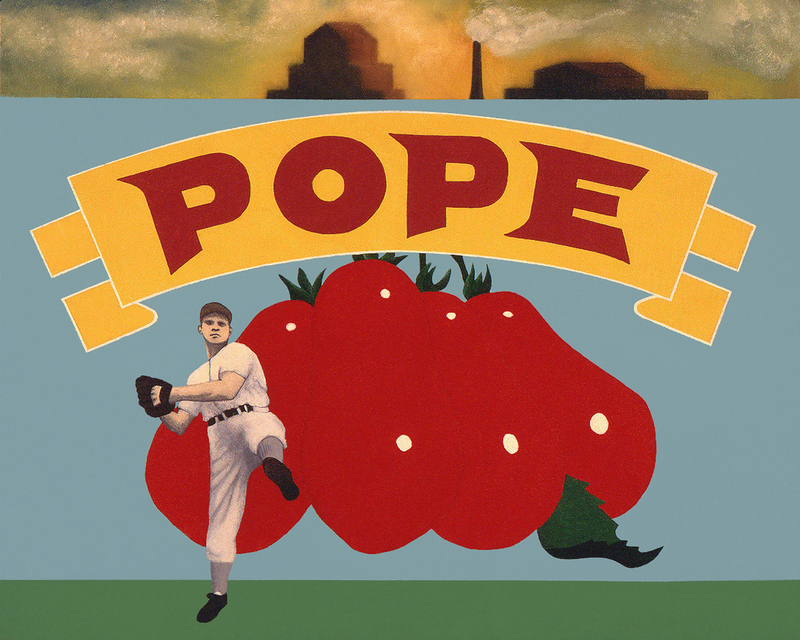 Vincent Scilla’s “Pope Sun-Ripened Tomatoes” was painted in 1990. Industrial and agrarian meet as the country boy leaves the farm and comes to town. 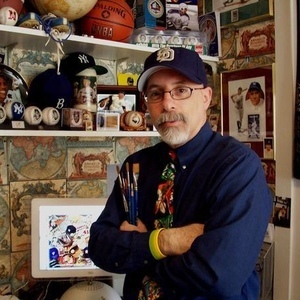 Despite being a prolific artist in multimedia formats, Scilla’s artwork–particularly his baseball paintings–has received the most amount of notoriety. Measuring at 8.4″ x 10″ and printed using archival inkjet print on somerset velvet paper, Vincent’s baseball paintings highlight his subjects by utilizing popular advertisements to serve as the backdrop with a true vintage feeling. 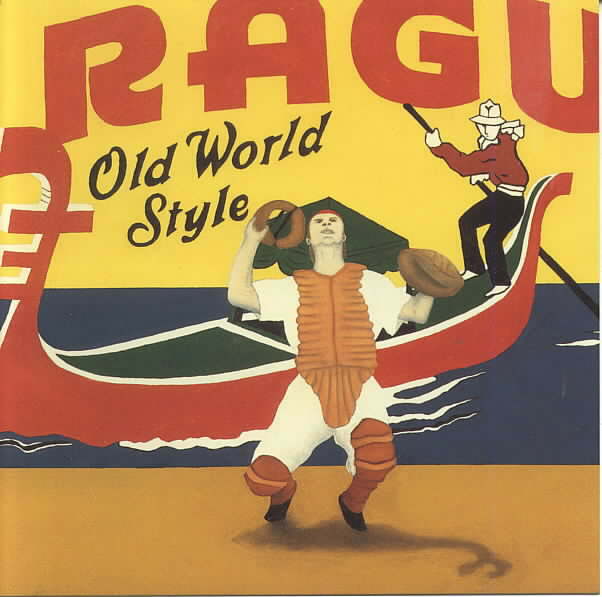 Ads from popular brands such as Krispy Kreme, Mercury Paint, Cracker Jack, Mobil Oil, White’s Dairy Bar and Ragu are included and used for various backdrops in some of the most unique baseball art anywhere. Vincent Scilla’s “Rocco Loved Ragu” was painted in 1989. All eyes are on the player in this Italian opera as the catcher circles under a pop-fly at center stage. Although Vincent Scilla often fuses commercial advertising and baseball in his artwork, he has some strong feelings on the branding of our national pastime. 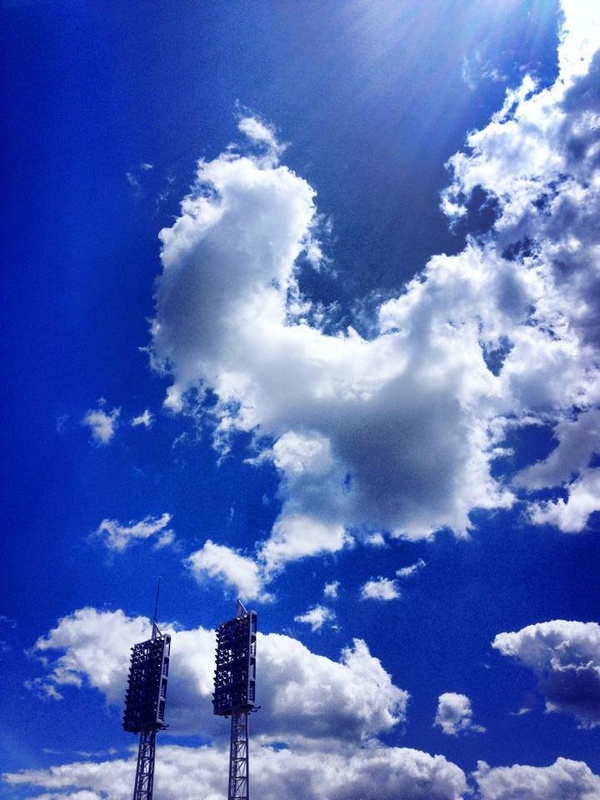 In his personal blog, Scilla wrote: “Contrary to what MLB thinks, baseball does not belong to them. It’s not their property. It is the property of generations of Americans dating back nearly 200 years. It’s our mythology and legends. I don’t need Mastercard telling me that.” Having his work displayed in the pages of various books– including “Diamonds Are Forever”, “Treasury of Baseball”, “Baseball Postcard Box”, and “Top of the Ninth”–as well as at some of the best galleries and ballparks in America, the great Italian American artist Vincent Scilla is undoubtedly in a league of his own. See for yourself at Convivio. Christopher Paluso designed the Artists’ Tribute to Italian Americans in Baseball banner. Christopher Paluso is a proud Italian American. 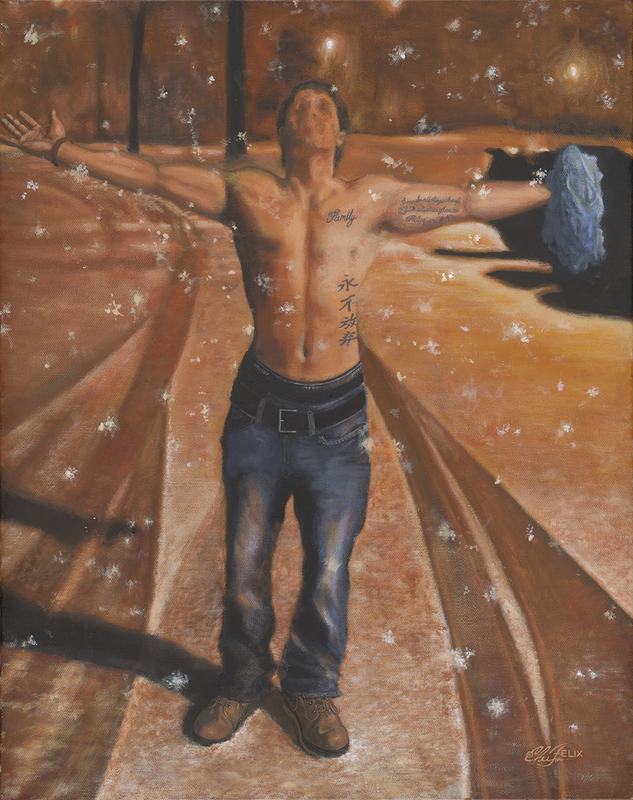 Christopher Paluso is a native San Diegan, an internationally recognized sports artist, illustrator and educator. Entrusted to create the images of their honored members, he is the Official Artist of the San Diego Hall of Champions’ Brietbard Hall of Fame, the San Diego Holiday Bowl Hall of Fame, the Hawthorne Race Course Jockey Hall of Fame, the Missouri Valley Conference Hall of Fame, and the National Italian American Sports Hall of Fame. Known for his ability to capture a strong real life likeness of his prized subjects, he has gained a massive amount of respect within the world of sports as well as kudos from insiders within the aerospace and entertainment industries. Paluso’s artworks of Muhammed Ali, Mickey Mantle, Joe DiMaggio, Wayne Gretzky, and Michael Jordan are among his most sought-after pieces. His art has been seen on everything from magazine covers to limited edition collector plates and lithographs. In addition to being one of top Italian American artists of our time, Paluso shares his craft with San Diego youth and adults working as an instructor teaching art at area public schools and the Convivio Center. Paluso’s love for his Italian heritage is apparent in his illustrations in the Artists’ Tribute to Italian Americans in Baseball exhibition. 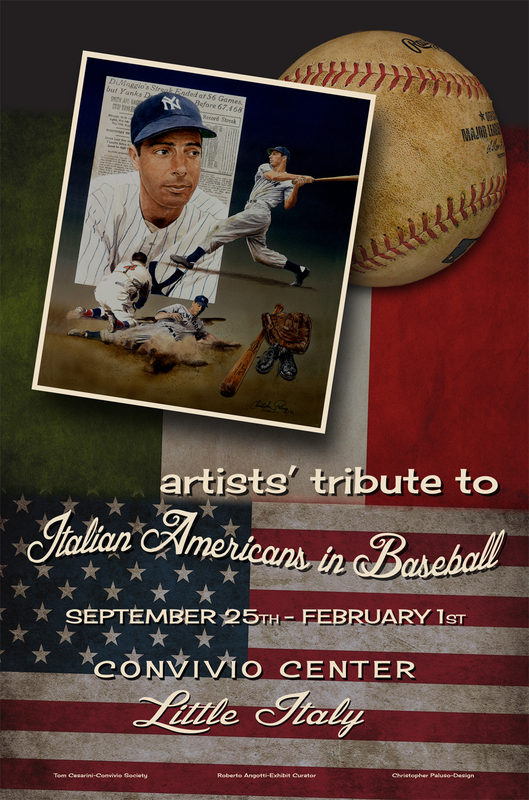 Artists’ Tribute to Italian Americans in Baseball at the Convivio Center on September 25, 2013. 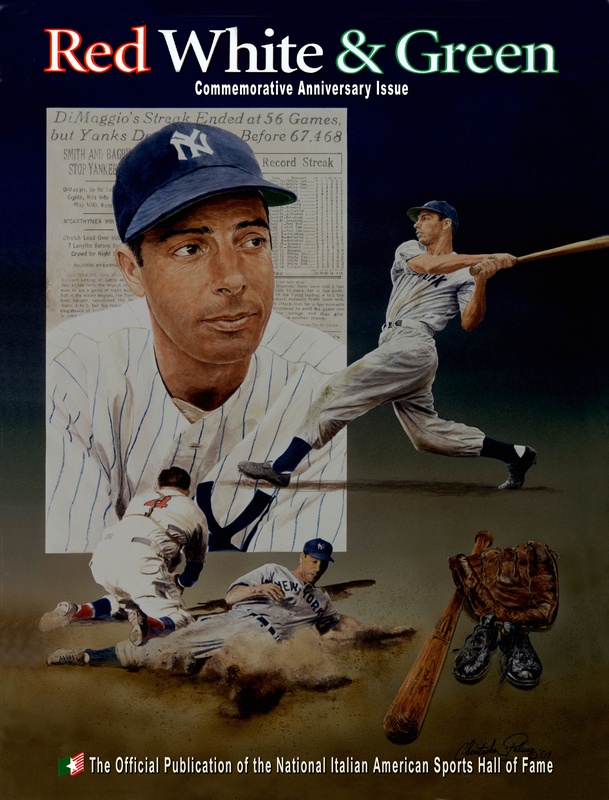 Perhaps one of Christopher Paluso’s most memorable moments took place when he was privately commissioned to create a painting of Joe DiMaggio for a lithograph project in 1992. 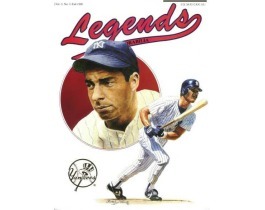 Paluso consulted with DiMaggio to get his vision depicting him as the complete ballplayer that he had been known and loved for. Just before the great Joe D passed away, he saw the image on the cover of the National Italian American Sports Hall of Fame magazine “Red, White & Green”. According to those close to DiMaggio, it was reported that he was very pleased with the design. Christopher Paluso designed this cover for the National Italian American Sports Hall of Fame. The Convivio Center serves as the home for lovers of all things Italian in San Diego. Paluso is offering an eight-week “Drawing Italian Style” class at the Convivio Center beginning Monday, January 6th at 7 pm. Borrowing from Italian Renaissance masters da Vinci, Michelangelo, and Raphael, students will learn about art history while discovering their individual creativity and unleashing the Italian in all of us. In addition to drawing shapes, using the value scale, proportions, and experimenting with one- and two-point perspective drawing, the very popular artist and illustrator will provide step-by-step instruction in the foundations of drawing, elements and principles of design as well as in the creation of classic-style drawings. For more information on the drawing class and the Vincent Scilla/Christopher Paluso meet-and-greet on Sunday, January 12th at 6:30 pm, visit http://www.ConvivioSociety.org or phone 619-573-4140. 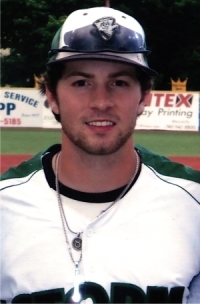 After setting single-season records as a Lake Erie College sophomore, the life and MLB dreams of 21-year-old Reid Rizzo were tragically cut short from his cardiomyopathy. up on his major league dreams–be included as well. Southern California baseball fans attending the grand opening and Phil Rizzuto birthday celebration on September 25th at Convivio will be pleasantly surprised that the Chris Felix collection includes Phil Rizzuto, Joey Votto and Reid Rizzo. Felix knew Rizzo was something special early on since he been Reid’s baseball coach for nearly for a decade. As a three-month-old infant, Rizzo’s parents received catastrophic news that their newborn son had been diagnosed with cardiomyopathy, a life-threatening heart condition. Despite doctors telling the Rizzo family that he would never be able to run, ride a bike, or play sports, Reid defied the odds by playing baseball, football, basketball and hockey. 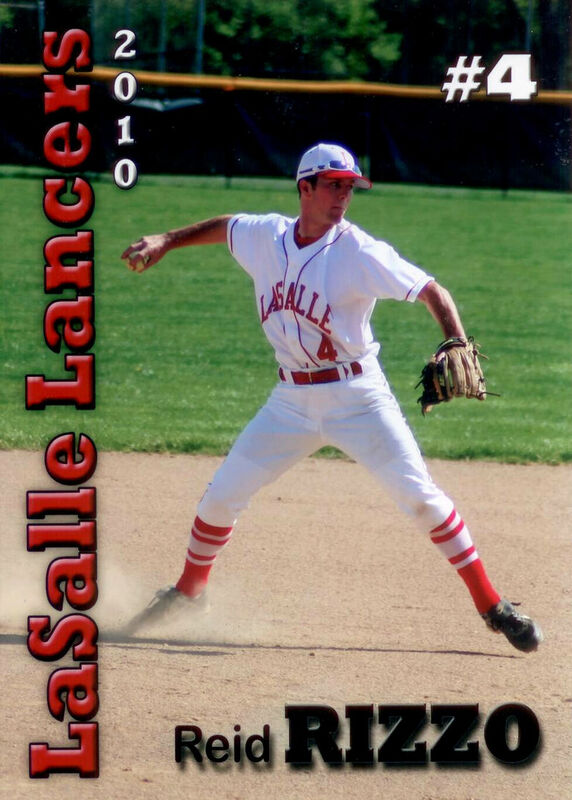 As a freshman at La Salle High School in Cincinnati, he became one of the youngest players in history to earn a starting position on the varsity baseball team. 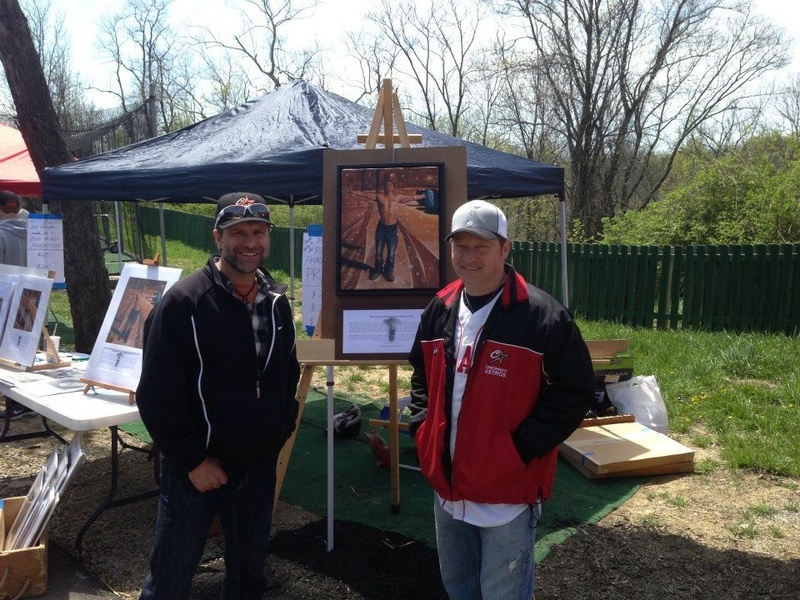 Chris Felix (left) signed and donated his original prints to benefit the Reid Rizzo Foundation. Reid Rizzo wore #4 while at La Salle. uncanny ability to make everyone feel special. Reid’s spirit lives on in each of those who knew him and in those who believe that all things are possible through Christ. Reid’s tattoos inspire many to live their lives to the fullest. His belief in family and his desire to be a positive role model for his younger sister and others exemplify who Reid was as a human being. Those who knew him believe his story to be inspirational.” Shortly after Reid’s passing, a few of his former coaches at La Salle High School decided to form a committee and hold a baseball tournament in Reid’s honor. many successful fundraising events including an annual Reid Rizzo Day at the Reds’ Great American Ballpark. The Reid Rizzo Foundation was established to remember and honor the character, courage, strength, and vigor of Reid Rizzo. The nonprofit’s goals include: provide financial assistance to those seeking to enhance their primary or secondary educational experience; enhance education, awareness and research relative to medical conditions that affect the cardiovascular system; and support athletic organizations wishing to enhance the support structure provided for the athletes they service. 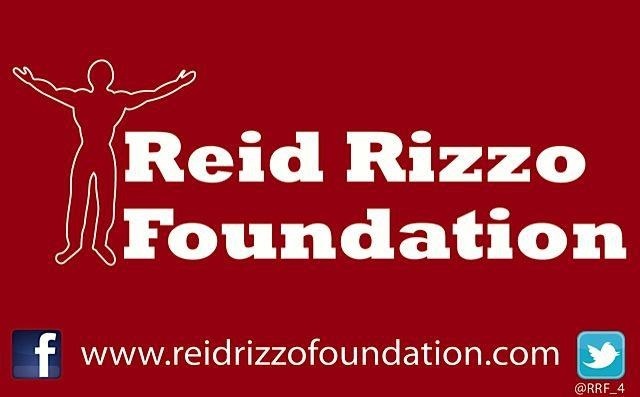 By clicking HERE, you can make a tax-deductible donation to the Reid Rizzo Foundation. Chris Felix will be featured in the Artists’ Tribute to Italian American Baseball at Convivio Center in San Diego beginning September 25th. 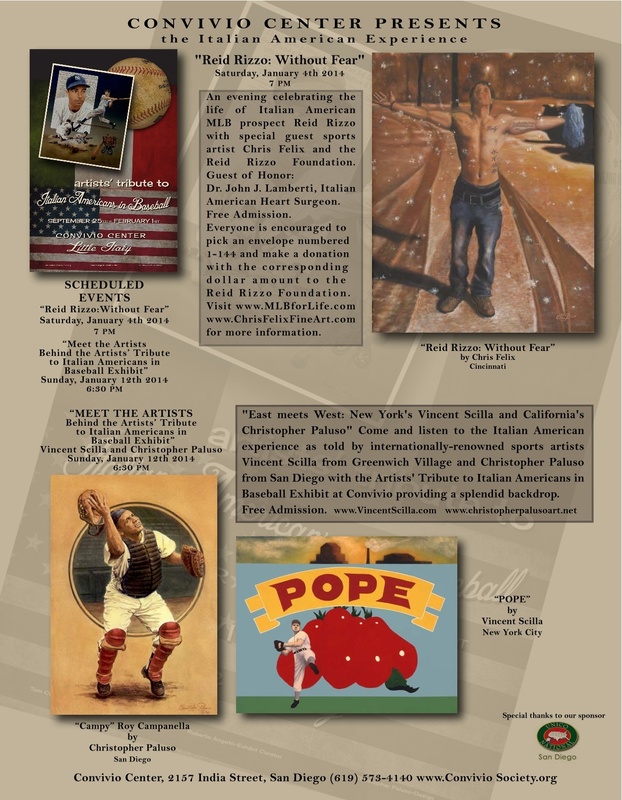 Artists’ Tribute to Italian American Baseball showcases original artwork, photographs, articles, uniforms, and other autographed one-of-a-kind artifacts. The exhibit officially opens to the public on Phil Rizzuto’s birthday, Wednesday, September 25th with a special 7 pm screening on Convivio’s big screen of Yankeeography, Volume Two featuring Phil “Scooter” Rizzuto. In addition to birthday cake being served to all attendees, baseball fans will have their first opportunity to see Chris Felix’s masterfully-crafted depiction of Phil Rizzuto as well as that of MLB All-Star Joey Votto and never-to-be-forgotten Reid Rizzo. 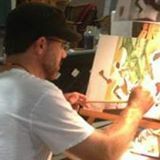 Other notable artists participating in the exhibition include James Fiorentino, Vincent Scilla, John Giarrizzo, Vernon Wells Jr., Tom Richmond, Jeremy Nash, Rob Monte, and Zack D’Ulisse. The Convivio Center is located at 2157 India Street in San Diego. 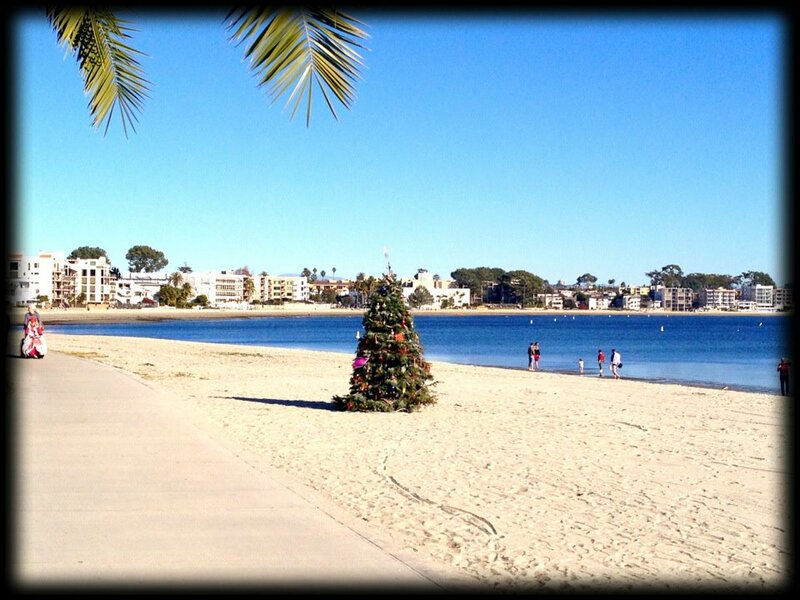 Call (619) 573-4140 for more information or click HERE for an updated calendar.